Slimming food has never tasted so good; the must-have first cookbook from the UK's most visited food blog. Sharing delicious home-style recipes with a hugely engaged online community, pinchofnom.com has helped millions of people to cook well and lose weight. 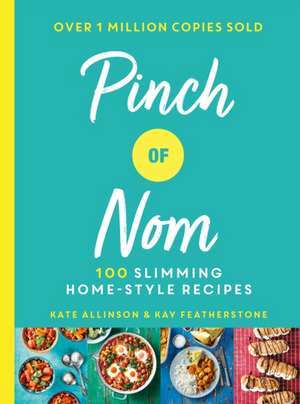 The Pinch of Nom cookbook can help novice and experienced home-cooks enjoy exciting, flavourful and satisfying meals. Accessible to everyone by not including diet points, all of these recipes are compatible with the principles of the UK's most popular diet programmes. There are 100 incredible recipes in the book, 33 of which are vegetarian. Each recipe has been tried and tested by twenty Pinch of Nom community members to ensure it is healthy, full of flavour and incredibly easy to make. Whether it's Cumberland Pie, Mediterranean Chicken Orzo, Mexican Chilli Beef or Chicken Balti, this food is so good you'll never guess the calorie count. This book does not include `values' from mainstream diet programmes as these are everchanging. Instead the recipes are labelled with helpful icons to guide you towards the ones that suit you best - whether you're looking for something veggie, fancy a fakeaway, want to feed a family of four or have limited time to spare.